Last week the Ailsa Floating Storage and Offloading unit (FSO) was successfully hooked up and completed, the final step of the FSO transportation and installation for the Culzean field, under the project management of Maersk Supply Service. The project has been delivered to Total E&P UK as an integrated solution, including project management, engineering, procurement and execution of offshore work scopes. 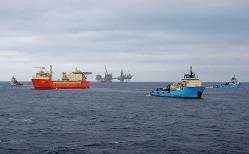 Eight Maersk Supply Service vessels and crew carried out the marine operations. A pair of Maersk Supply Service's new-build M-class anchor handling tug supply vessels were usded throughout the project. With its large deck, chain lockers and winches, the tensioning of twelve 50-tonne anchors was performed from Maersk Master in just two vessel mobilizations, achieving the highest tensioned mooring system in the North Sea at 723 tonnes. Installation of twelve 140 mm mooring chains and sheathed wires from Maersk Minder was also completed in two mobilizations.